"The Kathryn E. Wentz Juried Undergraduate Exhibition"
McDaniel College’s Department of Art and Art History presents “The Kathryn E. Wentz Juried Undergraduate Exhibition,” March 26 through April 5 in the Rice Gallery in Peterson Hall. The artists’ reception will be held from 5:30 to 7:30 p.m. on Thursday, March 28, with a Gallery Talk beginning at 6:00 p.m. Judges for this year’s exhibition are Dilay Koçogullari, a Baltimore-based, Turkish-born artist, and Nicole Ringel, a Baltimore-based artist and McDaniel alumna. Dilay Koçogullari is pursuing her MFA in Intermedia and Digital Arts at the University of Maryland, Baltimore County. She received her MA in Painting from Onsekiz Mart University in Canakkale, Turkey in 2011 a BA in Plastic Arts from Yeditepe University of Istanbul, Turkey in 2009, and a BA in Biology from the Department of Science in Eskisehir, Turkey in June 2004. Some of Koçogullari’s exhibitions include: Light City Project, Baltimore, MD, 2017; Mamut Art Project, “Micro-Macro Cosmos: Harmony of Perception,” Istanbul, Turkey, 2013; Ikametgah Kadikoy Festival, Halka Art Project, Istanbul, Turkey 2012; Umut Germec Master Atelier Exhibition, Canakkale, Turkey 2011; “Portable Borders” exhibition under Istanbul 2010 European Capital of Culture, Istanbul, Turkey, 2010; “Open City” exhibition under Canakkale 2010 Cultural Activities, Canakkale, Turkey, 2010; Kurye Video Festival, Istanbul, Turkey, 2009; and IMC 5533, Istanbul, 2008. Nicole Ringel is an artist living and working in Baltimore, Maryland. After graduating from McDaniel College in May of 2016 with a BA in both Studio Art and Art History, she began attending University of Maryland, Baltimore County where she is currently pursuing a Master of Fine Arts in Intermedia and Digital Art and teaching Print Media. By composing translucent layers of both appropriated and original text, her work employs printmaking, and projected stop motion animation to activate the simultaneously intimate and collective sensation inherent to the process of reading. Her work brings attention to the threshold between the body and written word, as well as the transformation of materials in the creation and destruction of erasure. She employs ephemeral, flowing presence and scale to create distinct moments of clarity that direct the viewer through space, and curate an interaction with poeticism that speaks to the simultaneity of individual and collective being. The exhibition is open to all students, who may submit up to five artworks they have done while studying at McDaniel College. 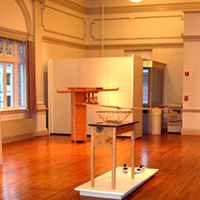 Professional artists and art educators serve as the exhibition’s jurors each year. Winners will be announced during the opening reception. The Rice Gallery is open Monday through Friday from 10:00 a.m. to 4:00 p.m. and Saturday from 12:00 p.m. to 5:00 pm. The exhibit and reception are free and open to the public. For information and to confirm gallery hours, please call 410-857-2595.